When I lived in Scotland my local water used to be a little trout river some thirty years into its post-industrial recovery. Aside from trout the river also held a large population of minnows. If I let a dry fly hang in the current below me some of these fish would gang up on it, badgering and pestering and eventually drowning the fly if I took too long working out the best cast to the feeding trout upstream. Occasionally, on water-hauling the line forward, I’d find some unlucky specimen had hooked itself and was now sailing gracelessly through the air to land with a splash on top of the trout I was trying to catch. If not all of us are quite so inept as to javelin small fry into the middle distance, most of us have at least noticed the attention these fish give to objects dropped into the water. Objects like my dry fly, or small pebbles, or crumbs from our bank-side lunches or even the cone of ash flicked from a decaying cigar. The fish seem to respond out of curiosity, and some are even bold enough to “taste” the item attracting their attention. We notice these obvious fish. But, we usually miss the fish that don’t come out from hiding, the shy, timid individuals that remain concealed, fearful of venturing out into the dangerous, open water. Biologists have only recently begun to pay particular attention to this kind of behavioral variation. One research group intrigued by the topic, decided to conduct some experiments on their local, warm-water lake. To set the experimental ball rolling they rowed out and dropped some wire minnow traps over the side of their boat. As these traps settled pumpkinseed sunfish swam over to investigate the commotion and a few entered the traps even though they contained no bait. After a while the biologists hauled in the fish that had become trapped and, to complete the picture, they used a seine net to catch other pumpkinseeds in the vicinity that hadn’t ventured out from hiding. Back in the laboratory and then later in the lake too they compared the responses of the two groups – the trapped fish versus the seined fish. What the biologists uncovered were two groups of fish that not only had very different behaviors but that also differed consistently in these behaviors. Fish didn’t swim into a trap on one day and not on another. Instead, those that did swim into a trap were much more likely to do so again whenever one was lowered into the water. This behavioral divergence was associated with other consistent differences too. The kind of fish that entered the trap were less social, more prepared to investigate other novel items, quicker to relax in the presence of an intruder and more likely to feed on prey that was riskier and needed more attention to catch. The results, along with those from other research groups, have allowed biologists to start formally describing an area of animal behavior often remarked on, but only thought to apply, in any profound way, to another quite different animal. In humans there is a well-described range of behaviors called the shy-bold continuum. At one end are those who are painfully shy, timid and careful introverts. At the other end there are bold, inquisitive, risk-taking extroverts. Between the two are people who lean slightly more to one end of this behavioral spectrum than the other. And then there are those strange, well-balanced folk found firmly in the middle. The shy-bold axis is one of our most fundamental categories of personality. 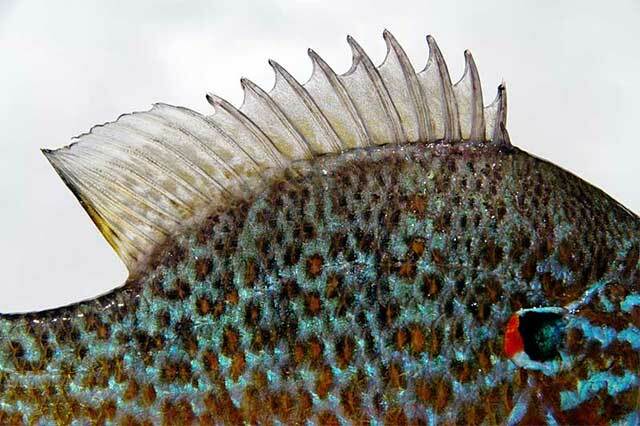 The study on pumpkinseeds demonstrates that fish too can be categorized in this way: there really are shy fish and bold fish swimming in our lakes, rivers and seas. So, that being the case, quod erat demonstrandum as it were, fish must also have personalities. Except, wait…. fish have personalities? People have ‘personalities’ yes (it’s in the word after all) but not fish. And so here lies something of a conundrum. Although some biologists have pointed out that individual behavioral variation might be important, modern ecology has largely ignored the issue when attempting to describe and model how an animal should behave to optimize its chance of surviving and reproducing. An animal behaving outside this optimum was seen as being a bit wonky, maladapted, an individual to be left out of serious descriptions of the general best behavioral practice. That said one would only have to ask dog owners about non-human animals and personality. They would likely say that dogs not only have personalities but that each has its own unique personality. Using dogs and other pets to demonstrate individual variation in behavior is a little tricky though. Concentrated selective breeding for Labradoodles and Cockapoos can literally mess with a pooch’s mind, leaving peculiar behavior the norm, behavior that would not be tolerated in the wild. And anyway, an owner’s view of their animal can be, what shall I say… a little skewed? Despite this many of our most domesticated animals are as we see them now because a particular temperament (a synonym for personality) has been selected for, by us, over time: the docility of cows, the sociability of sheep, the stoicism of the police horse, the patience of the guide dog. No one person, or fish for that matter, is made up of a single trait of course. For us there are considered to be five main personality types (“The Big Five Personalities Traits”). Biologists also now recognize five core personality traits for non-human animals: the shy – bold axis as has already been mentioned; exploration – avoidance; active – sedentary; aggressive – unaggressive and social – asocial. Each individual is a combination of traits from across this broader range of characteristic behaviors. Underlying and driving these behaviors are the hidden reasons, the proximate mechanisms that create personality. Differences in metabolic rates, in organ size, in hormone balances and other chemical gubbins that act on the neural system to prompt us and other animals to do what we do. That is not to say that other motivations aren’t important. They are. How hungry an animal is, its reproductive status, the temperature, the clarity of the water and a myriad of other factors combine to influence an individual’s behavior at any one time point. Yet, entwined with this, an animal’s personality will strongly influence, for example, where they look for food, how much they will eat when they find it, the variety of food they will eat, how aggressively they defend their food, how soon they will stop feeding, how easily they are disturbed, how soon they recover after being disturbed, and on and on. This is true for us, and it now, turns out to be true for wild animals, including fish like brook trout. Most studies on fish personalities have looked into the causes and consequences of being shy or bold. But a series of studies on young brook trout have shown that they can be classified along another of the behavioral continuums, one involving movement and exploration. Brook trout in streams seem to be either “stayers” or “movers”. Some individuals keep to the margins, explore little, hold down near the streambed and rarely venture out into the wide world. At the other end of the spectrum are those that swim higher in the water column and actively search for food. This difference in activity is consistent and results in other intriguing effects. The two brook trout personalities feed on different items. The explorers take a high proportion of their food from up in the water column and from the surface. One might expect them to be very susceptible to our dry flies given that terrestrials make up a large part of their diet. The stayers, on the other hand, are more likely to inhale a drifted nymph trundled down near the riverbed along the edge of the current. Their little bellies contain a higher number of benthic invertebrates – the bottom dwelling nymphs and scuds. 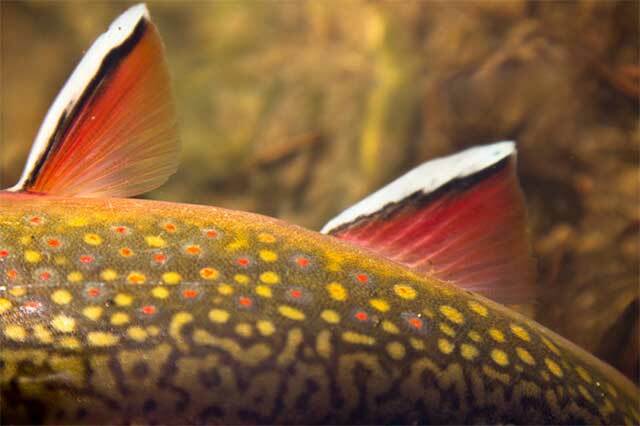 Keeping to two quite distinct areas has another effect on these brook trout. Those that continue to spend time in the water column develop smaller fins and have a svelte, more streamlined form all the better to slip through the water’s flow. Those that stick to the slower, deeper water become more rotund and have larger fins. Such differences aren’t confined to brook trout and running water but are broadly applicable across many species. Bluegills, for example, were thought to be generalist predators adept at feeding in both marginal, vegetated habitats and out in the open water. In fact, the consensus is now that bluegills show large variations in individual foraging behavior and habitat choice. Bluegills introduced into new water rapidly specialize in their habitat type and feeding preferences. Their specialization is so specific that those fish that prefer the open water do very badly when made to look for food in the complex environment of the margins, just as those specializing in the margins do poorly if made to move to open water. The different choices bluegills make is strongly associated with their personality. Bold and active individuals with a tendency to explore are found in the open water and, like brook trout, this leads to body shapes better suited to that habitat. A population of fish doesn’t usually live on its own and the presence of other species, as competitors or prey or predators, will influence the proportion of personality types any particular water contains. It might seem that fish with shy, timid personalities, fish that hide early and don’t come out until the coast is clear would do better than fish with bold, active personalities when there are predators around. Not so. A number of studies show that populations coming from high predator environments tend to be dominated by bold individuals. This may seem counterintuitive, but a fish consistently reacting to a predator by hiding early and staying hidden for a while after the threat has gone, will lose out on numerous feeding and mating opportunities. Fish that are prepared take risks in the presence of a predator may well be eaten more than the shy ones, but those that survive will be in much better shape than those that hide away. We fly fishers often describe ourselves as predators too and our success is directly influenced by the balance of personality types among the fish we try to catch. This is clear from the studies on largemouth bass I highlighted in last month’s article that showed some individual bass are caught repeatedly whereas others are never, or hardly ever caught. This kind of disparity reinforces folklore about there being ‘dumb’ and ‘smart’ fish. We all know the most stupid fish of course – the hatchery “pellet-head”. Yet, while they are often described as being “dumb as a box of rocks” it is really more the case that, driven by our selection for fast growth rate in the hyper-competitive environment of a concrete raceway, they have concurrently been selected to be extremely bold, aggressive, risk takers. Their personality is out of place when these fish are stocked in rivers and lakes for we and other predators soon catch them. Mind, if a wild fish, with its more tempered personality, were put in a raceway full of hatchery fish it would be similarly out of place. So, environmental context is important for determining what combination of traits and therefore what overall personality type, will best suit a water. In one environment stocked fish will seem to have a hive of personality disorders; in another their personality is the apogee of correct behavior. Being predators and more likely to catch one ‘kind’ of fish than another it is also the case that fishermen can change the natural balance of a water. Those studies on bass showed that by removing the bold fish (which also happen to be the best parents) we could favor the timid fish. This is at odds with the natural predators mentioned above whose presence tends to favor the survival of bold prey fish. But then we are, when we want to be, very efficient predators and at least in the old days our harvest impact was much more intense than natural predation. This type of pressure on an environment not only reduces the absolute number of fish but may also have favored the survival of the most timid individuals, ironically, if it really mattered at that stage, leaving the remaining fish much harder to catch. Most responsible fly fishers avoid the issue nowadays by practicing catch and release, a practice that should maintain the original balance of personality types in the water and so ensure that the fish remain just as easy to catch in the future. However, maintaining a fish population’s vulnerability to our flies is not simply a question of personality for it ignores another aspect of fish behavior, one that has been a favorite subject of debate among fly fishers for some time. Being caught is not likely to be an experience any fish, be it bold or shy, aggressive or timid, explorer or homebody, would like to have repeated. So, we might expect that a caught and released fish would do something to avoid being caught again. 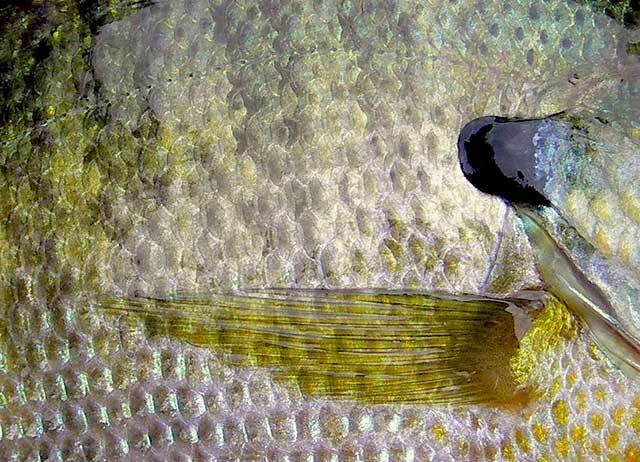 We might expect such a fish to learn to give our flies a wide berth with the consequence that, like removing the bold, vulnerable fish, a water becomes progressively harder, more “technical” as the fish gains experience and learns to discriminate against our attempts to catch them. But can fish do this? Do they have the cognitive horsepower, can they show the feats of discrimination, of learning and remembering that this would require? After all, don’t they have brains the size of a pea and a memory measured in seconds? I’ll be having a look at some of the issues and evidence associated with “learned hook avoidance” next month.